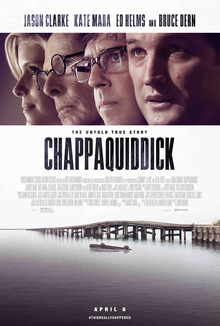 Hollywood will release Chappaquiddick, a movie Chronicling the sordid behavior of Massachusetts Sen. Edward “Ted” Kennedy, next month. It’s long overdue. The movie will only underscore why I and millions of other conservatives around the country harbor such as deep loathing for our liberal ruling class. Think about this for a moment: Following the incident on the bridge, Paddy Caligula IV (following in the footsteps of Joe, Jack and Bob), “walked back to his motel, complained to the manager about a noisy party, took a shower, went to sleep, ordered newspapers when he woke up and spoke to a friend and two lawyers before finally calling the police. As it turned out, Mary Jo Kopechne survived for hours due to an air pocked in the car and then presumably died of slow asphyxiation. If he had called for help immediately after the incident, she conceivably would still be alive today. Yet, thanks to a combination of three things – Kennedy money, media complicity and the herd mentality among the rank-and-file left – Lascivious Ted lived out his life as the apotheosis of American progressive liberalism. He was lionized not only as the heir of Camelot but even posed a serious intra-party challenge to incumbent President Jimmy Carter in 1980. Yes, his sexual predation apparently rivaled that of the notorious Harvey Weinstein, who inspired the #MeToo movement. In fact, Kennedy’s lechery even exceeded his older siblings and his father, which is saying a lot. And yet, the enlightened progressive voters of the Bay State overlooked all of this time and again. A time or two in my life, I’ve been subjected to ribbing for coming from a state that idolized the likes of George Wallace and that even carried this adulation over to his ill-fated wife, Lurleen. Yet, it seems to have paled in comparison to the Kennedy cult of Massachusetts. To be sure, there are certainly some very bad apples in conservative/Republican ranks, but I really would contend that they simply can’t get away with as much. Honestly, if Ronald Reagan or one of the Bush siblings had run a woman off a bridge and waited hours to inform police, they not only would have been indicted but also would have faced utterly derailed political careers. They would not be lionized to the ends of their lives as paragons of conservative virtue. Under the circumstances, isn’t it just a little easier to grasp the rage that Richard Nixon, American political history’s classic underdog, felt for the Kennedy siblings – all of whom essentially were entitled, spoiled brats who carried on the philandering, exploitative lifestyle of their father, Bootleggin’ Joe? Wayne Flynt, Auburn University emeritus professor of history, has cultivated a reputation as Alabama’s progressive conscience. He is a prodigious writer who has published some 13 books on the history of Alabama and the South. Predictably, he has weighed in on the upcoming Alabama Senate election, offering less than a savory view of Republican nominee Roy Moore. “Law to Moore is merely an instrument of exclusion and oppression, whether of women, teenage girls, African Americans, immigrants, Jews, Muslims, or homosexuals,” he contends. I’m not surprised that Flynt regards Moore as the worst threat to Alabama’s reputation since Eugene “Bull” Conner. But I do find it slightly irritating whenever Flynt raises these issues as an excuse to engage in another round of self-flagellation over what he perceives to be Alabama’s wretched political and cultural legacy, one for which Alabamians are obligated to atone. I’ve never liked this sackcloth-and-ashes approach and that goes for countless other Alabamians. I am far from a scion of the old South. I come from simple old yeoman Southern stock, particularly on my father’s side. My paternal line and much of my maternal one were among the thousands of lumbers – desperately poor whites – who poured into this impoverished region in the early 1800’s simply because they had no place else to go. Alabama was not only encumbered with legions of struggling poor whites but also with a slave economy that maintained a predominant hold in the Southern half of the state – one that collapsed after the close of the Civil War. Essentially we are talking about a deeply bifurcated state, culturally, politically and economically, that has been digging itself out of poverty and relative backwardness – imposed, incidentally by the Yankee equivalent of the British Raj – since the end of the Civil War. One of the only socially redeeming factors on the Alabama frontier was evangelical religion, which dragged so many of our forebears away from a life of gambling, drinking and bare-knuckle fighting. This old religion, largely imported from New England, carried a strong Calvinist hue, and it carved out a place in the hearts of many Alabamians, even among apostates like me. It is deeply embedded in our DNA – as much as Catholicism is in Irish cultural DNA. It’s not surprising that many of us identify with Moore’s public avowal of religious faith and propriety. Alabama, like every other state in this Union, evolved out of a unique set of circumstances. And our politics and culture reflect many effects of that development. Personally, there are many aspects of New England society that I find appallingly irritating and abhorrent and that have adversely affected the course of this country, especially after these tawdry shits became the cultural and economic hegemons after the war. Yet, they have enjoyed a free pass, largely because they remain our national and cultural hegemons. Southerners, on the other hand, remain a special focus of animus among these people and their spiritual and intellectual progeny on the Left Coast. That is not all that surprising: As the world’s first propositional nation, Americans have always required a focus of animus, which the South has supplied, however unwittingly, since this country’s founding. Consequently, every other ethnic group and region is afforded a pass for bad behavior stemming from its cultural inheritance EXCEPT the South, despite our region’s having inherited a cultural legacy with both good and bad elements like every other ethnic group and region in this nation and throughout the entire planet. And honestly, given the unfortunate set of circumstances that fate has meted out to this region beginning with its initial settlement, why should we expect anything to have turned out differently – really? Writer Jim Goad has argued – convincingly, I would contend – that Southerner and other poor Back Country whites provide elite American whites with a basis for conveniently passing off their collective guilt and insecurities. I’ve grown weary of this – and, quite frankly, it explains why I insist on flying only an Alabama flag on my property. It’s hard to think of myself as an American when this region of the country is treated as the national hind teat and relegated to sitting on a stool of everlasting repentance. Yes, Professor Flynt, you have every right to bemoan the legacy of his native state – that’s your First Amendment right – but I and tens of thousands of Alabamians are tired of it. And while I am at it, what the hell is “white” – really? Do, say, Italians and Armenians, even though they are Caucasian, share the same American experience and legacy as a WASP family from the historic Beacon Hill section of Boston? I even take umbrage with the term WASP. There is arguably not much WASPish about the lumbers (desperately poor whites) who settled much of the American Back Country. I think that we all could make a fresh start by resolving that our ruling class will no longer supply classifications to the rest of us. And, incidentally, this increasingly tangled ethnic American web – this ruling class strategy to pit one group against another – is another legacy of Wilsonian federalism. Our federal bonds are fraying. We Americans increasingly are conditioned to view federalism and, along with it, national unity, in zero-sum terms. And why shouldn’t we? The century-old cookie-cutter-style federalism imposed on this country via Wilsonian progressivism has been stretched far beyond the limits of its design function. It’s grown increasingly threadbare. It’s no longer equipped to accommodate the world’s largest and most diverse economy, much less a culture that is growing increasingly diverse and divided. The latest evidence attesting to this fact: The uproar among several blue states – California, New York, Connecticut and Oregon, to name a few – over the House Republican tax cut plan. The House bill would eliminate the most widely-used deduction – income tax – and would cap property tax deductions, the second most-used, at $10,000. Here’s the rub: Many high tax blue states rely heavily on these state and local deductions. Consequently, many middle-class families in these states will end up paying more under the plan. This is a lesson in history repeating itself – and possibly with dire consequences. This growing dissension among states over tax policy bears remarkable parallels to the vexatious debates over tariff policy in the years leading up to the Civil War. This dissension contributed mightily to the already toxic relations between the manufacturing Northeastern states, which favored high, protective tariffs, and the agrarian, slave-holding, export-oriented Southern states, which insisted on low tariffs levied only to raise essential federal revenue. And, honestly, why should blue states be expected to foot tax relief for the rest of the country? Some here in the red hinterland would argue that states that operate expansive and expensive safety nets have backed themselves into tight fiscal corners and no grounds for complaint. But isn’t this their prerogative as sovereign states within a federal union? This brings me to a social media exchange I had with some friends this morning regarding the future of the country and strategies for restoring some semblance of a social policy, one that accommodates all regions and classes throughout country. I related to them that for the past generation or so, I’ve striven to become an amateur scholar of post-war politics and economics of post-war West Germany. As a Tory conservative, I believe that there is much that Americans in the highly secularized, post-Christian 21st century can learn from this morally ravaged society. I especially admire the old West German Christian Democratic party, which strove to restore a measure sanity to a morally and ethically gutted out post-Nazi society. Moreover, I admire deeply the social market economy that emerged after the war. As this term, social market, implies, it was an attempt by the Christian Democratic Chancellor Konrad Adenauer and his fledgling party not only to stave off socialism but also to build a vibrant post-war free-market economy, albeit one that would provide a reasonably generous safety net and collective bargaining for the working class. Frankly I would like to replicate some version of the social market to American conditions, but the more I reflect on this, the more it occurs to me that this country is simply to big and diverse – not to mention, badly divided – to implement any such system over a vast scale. What worked – and, to a degree, still works – in a relatively organic society like Germany, simply isn’t tenable in this United States. I could marshal a number of historical arguments for his, but in the interests of brevity, I wont. Suffice it to say that part of the challenge stems zero-sum views on federalism into which so many of us have fallen. Blue-state Americans seem to regard any concession to red-state America as tantamount to moral and political betrayal and vice versa. Under the circumstances, we seem to have drifted far past the point where any kind of humane social order can be established in a nation as large and diverse as the present-day United States. Indeed, the more I think about all of this, the more inclined I am to adhere to the vision a new constitutional order outlined by the late American diplomat and statesman George F. Kennan. Maybe the only viable option for American federalism is to heed his call to devolve power to 10 to 12 smaller entities – constituent republics in which citizens share strong historical and cultural affinities. We could still share a common market and a common defense, but responsibilities for implementing social policies such as healthcare, social security, etc., would be left more or less exclusively to these constituent republics. Yes, this amounts to a systemic, radical change, but is there really any other choice? Aren’t many states evolving what amounts to different social and economic systems? California, which possesses the fifth largest economy in the world, has evolved social policies and even a legal system that diverges significantly from much of the rest of the country. Under the circumstances, should we really be surprised that an increasing number of states are coming to regard federalism as a zero-sum game? Conservative commentators are already characterizing the Mueller indictments as a nothing burger in terms of how this investigation ultimately will pan out for Trump. Investigators will turn up no significant evidence of collusion, many contend, and much of what’s discovered ultimately will portend serious consequences for the Clintons, whose allies, the Podestas, seem to be deeply invested in their own version of Russian collusion. But as millions of deplorables see it, this investigation has amounted to a fishing expedition from the very beginning. And that is precisely why I’ve always regarded it with considerable amount of apprehension from the start. Mueller is likely only getting started, and in time, he may end up nailing Trump on something entirely unrelated to Russia collusion: his business dealings. Frankly, I’ve never doubted for a moment that Trump is a shady business dealer. I imagine that most New York real estate moguls are. Likewise, I presume that most of his supporters have drawn the same conclusion. But when have rank-and-file Trumpistas ever been interested in his moral or ethical probity, at least, insofar as his past business dealings are concerned? As I see it, most deplorables understand that we live in singular, if not desperate, times. Many have come to draw a distinction between people who get rich from rather specious market deals (i.e., the Trumps) and those who apparently cash in on government service (i.e., the Clintons). For millions Trump supporters, it simply boiled down to finding a mean, tough avaricious SOB to go mano a mano against all the mean tough, avaricious SOBs who run the swamp in Washington. To paraphrase an old saying, Trump’s an SOB, but he’s our SOB. So, what happens if the Mueller investigation turns up little, if any, Russian collusion and nails Trump instead on shady business dealings? I am reminded of Jefferson’s fire bell in the night. This could turn out to be 21st century America’s version of the ill-fated Missouri compromise of 1820, the implications of which sparked Jefferson’s troubling late-night epiphany. Like the Missouri Compromise, a Mueller indictment of Trump on unanticipated grounds could have long-term consequences for American unity. It could set off a train of events that ultimately could lead this country into a deep, dark abyss, much as the Missouri Compromise ultimately did. Tens of millions of rank-and-file Trump supporters are going to perceive the Mueller investigation simply as what it arguably is: a fishing expedition undertaken by the ruling class to depose Trump – and the election results – so that it can get back to the old business of spreading more lilies and alligators throughout the Swamp. What will follow? Right-wing retrenchment? Perpetual government gridlock? A wrenching and protracted upheaval of American political structure? Widespread social unrest? We can be virtually certain of one thing: tens of Americans, certainly in the sprawling red hinterland, will likely emerge from all of this angrier and more cynical than ever. Gen. John Kelly has predictably ignited a media firestorm for summoning the temerity to state that Gen. Robert E. Lee was behaving like most Americans of his time by choosing state over national allegiance. Sorry if I offend some of you, but I proudly and zealously place state and region over country. I happen to believe that the federal government is a constitutional republic conceived with sharply delineated powers and commissioned by the people of initially 11 (later 13) republics to operate as their common agent. Modern Americans may even find it astonishing to learn early 19th century students at West Point, including the future Gen. Lee, studied a constitutional textbook written by attorney and legal scholar William Rawle and titled “A Constitutional View of the United States” that acknowledge the right of secession. Of course, many of the nation’s premiere historians are weighing in on these intemperate statements, wondering how a man of Kelly’s immense accomplishments and responsibilities could harbor such antiquarian views. As for the views of these historians, I call on all of you to consider how all facets of American education, for better or worse, have been transformed within the last 60-plus years, largely as a result of the infusion of federal money and the expansion of federal patronage that has followed. This has been accompanied by what I have come to call a miasmic orthodoxy that has settled on all levels of American education. Under the circumstances, can you see how pluralistic thinking among scholars, especially within the humanities, has been undermined?